Having released their exceptional eighth studio album, Nightbringers, melodic death metal titans the Black Dahlia Murder are now on a lengthy tour featuring some of extreme metal's finest acts, which made its way to Toronto's Opera House last night (October 18). Opening up the night were Vancouver blackened death metal group Wormwitch, who got fans warmed up for the chaos that was about to unfold. Their harsh screams, d-beat drumming and razor-sharp riffs were well received by the small crowd still filtering in. Necrot brought the night to the moment where it would be pure death metal brutality from there on out; the trio's old-school death metal influence shone through in their performance, mixing downtempo, chugged-out riffing and thrash with an onslaught of machine gun-like kick drums and swampy, guttural vocals. The band managed to get the still-small crowd to open up the night's first mosh pit before launching into their last few moments of full-borne death metal. After an ominous, tension-building intro, California tech-death masters Decrepit Birth emerged with a barrage of dizzying technicality that quickly caught the crowd's attention. Vocalist Bill Robinson wildly whipped his mane of dreadlocks around as he commanded the crowd with his grotesque, gurgling voice. The crowd seemed mesmerized by the lightning-fast drum work and perfectly executed guitar and bass work, until Robinson took it upon himself to get fans moving, lunging into the crowd and violently throwing around everyone within arm's reach. After returning to the stage, Robinson led the band in a few more rounds of savage death metal precision that left a lasting impression on those who might not have heard the band until then. Death metal pioneers Suffocation opted for live vocalist Kevin Muller to perform their set this night instead of founding vocalist Frank Mullen, but Muller proved his worth to the band right from the opening notes of opening track "Thrones of Blood." Keeping the energy up, the band launched into the vicious classic "Pierced From Within," which saw drummer Eric Morotti swiftly spinning his drumsticks in time with every ear-piercing cymbal hit during the song's breakdown. Muller frequently interacted with the crowd to gauge the response to their new lineup, which was clearly positive — then, he called for a wall of death that sent the crowd quickly into a frenzy when the band launched into "Funeral Inception." Nearly 30 years since their inception, Suffocation displayed that they're an integral part of death metal's history, and that they still have what it takes to put on a great performance. 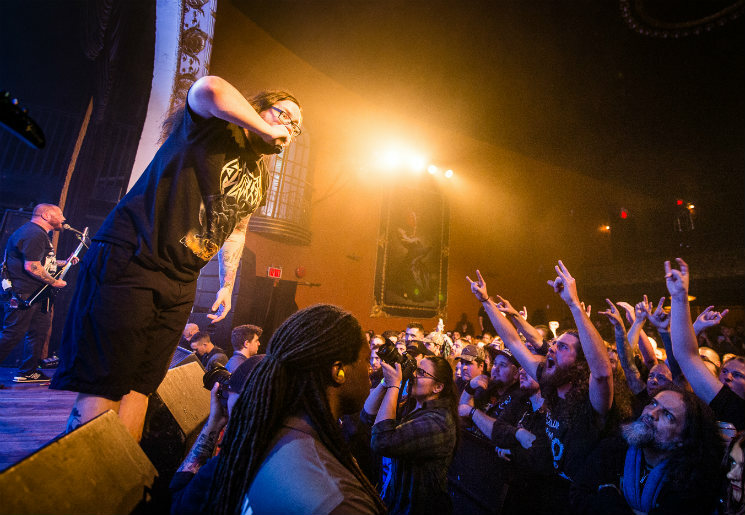 The moment everyone was waiting for finally came when the Black Dahlia Murder arrived on stage, instantly revving up the crowd with new album cut "Widowmaker." A few songs into their performance, it became apparent they would be playing a career-spanning setlist, as they followed up with "Statutory Ape," "Contagion" and "I Worship Only What You Bleed" from their first three albums. The crowd were ferocious with each other, spurred on by the band, who nearly didn't stop playing for the first half of their set. Finally, everyone got a breather as the lights faded to black before the band launched into another flurry of blast beats, breakneck riffing and vocalist Trevor Strnad's vast vocal range on "A Shrine to Madness." As the opening chugs of "What a Horrible Night to Have a Curse" began, bodies started flying over top of each other at a pace that was kept up for the majority of their set. As the band's enormous 20-song set was coming to an end, Strnad teased the crowd that they would have to get the rest of their energy out in two songs, before kicking into "Deathmask Divine" and the triumphant "I Will Return." If the Black Dahlia Murder have been able to perfect not only their recorded material but their live show as well as they have in a decade-and-a-half of being together, the next 15 years are sure to be promising for fans.